The ride-share service probably isn’t increasing congestion. Uber has replaced millions of Manhattan taxi pickups, according to newly released city data. Uber isn’t adding to Manhattan’s traffic congestion, according to newly released city data. New York City Mayor Bill de Blasio took aim at Uber this summer, trying (and failing) to set a cap on the number of its for-hire cars operating in the city. The ride-share service has drawn criticism on a number of issues — including its labor practices — but the mayor said his main concern was traffic congestion. The number of yellow and green taxis on New York’s streets is carefully controlled by the city. Would additional pickups from an uncapped Uber fleet lead to urban gridlock? Based on year-over-year counts, these fears appear to be unfounded. 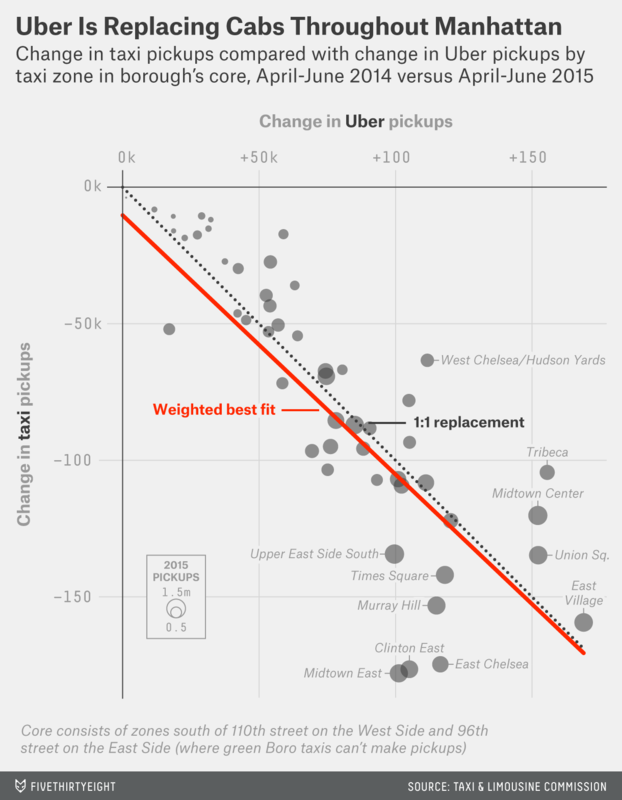 Uber has not caused a net increase in pickups, at least not in Manhattan, according to a FiveThirtyEight analysis of pickup data. Instead, the ride-share service is replacing cabs in the center of the city and supplementing them in the outer boroughs. Three million additional pickups sounds like a substantial increase, but the big question — as The Economist pointed out in August — is where those trips are coming from. It would be a problem if those new trips were originating in central and lower Manhattan, the region’s congested core. That’s where de Blasio focused his concerns about new traffic, and it’s the area that Uber was most aggressively targeting with driver incentives. On the other hand, new pickups would be less of a problem in the other boroughs and in northern Manhattan, where the city has tried to increase cab availability through the green Boro taxi program. It would be harder for de Blasio to push back against Uber if it were primarily adding pickups in these areas. 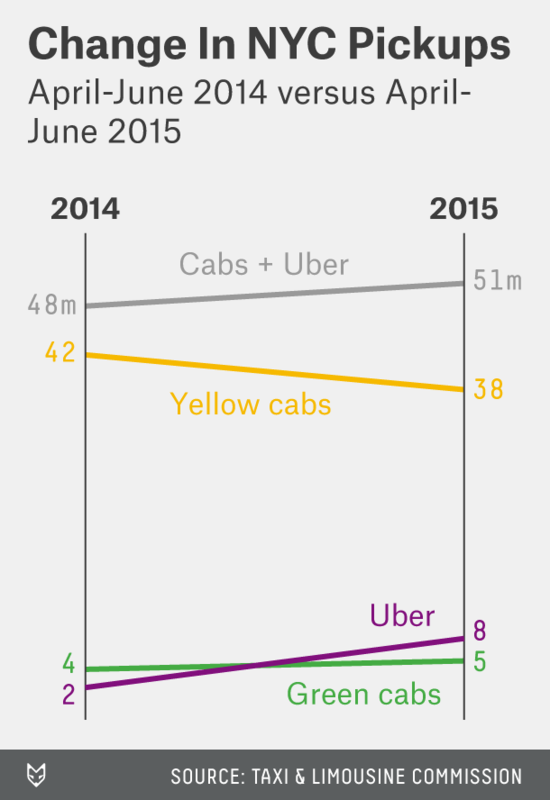 The maps below show the net change in total, taxi, and Uber pickups from April-June 2014 to April-June 2015. Zones marked in blue experienced a net decrease in pickups, while red zones saw a net increase. Both taxis and Ubers increased their pickups in Brooklyn and Queens, particularly in gentrifying areas; the services are supplementing each other in these neighborhoods. Uber also gained in Staten Island and the Bronx, while taxi pickups were flat in those boroughs. In Manhattan’s core — the area outlined on the maps above, where green cabs aren’t allowed to make pickups2 — Uber added 3.82 million trips in April through June of this year, compared with the same period a year earlier. Taxis, in the same area, lost 3.83 million pickups. The total number of pickups was virtually unchanged: 39.37 million in 2014 versus 39.36 million in 2015. Throughout Manhattan, riders have shifted from taxis to Ubers millions of times, perhaps attracted to features Uber promotes as advantages: newer cars, no need to hail, driver ratings and no tipping. These features, though, don’t appear to have pulled Manhattanites from their private cars, subways, buses or bikes: The total number of taxi and Uber rides didn’t grow. “Pickups aren’t the whole picture, and they don’t shed light on most of the actual contributors to congestion,” Wiley Norvell, a de Blasio spokesman, said in an emailed statement. Those contributors, he said, include how many for-hire cars are on the road, how long their trips are, and how much they cruise between fares. He added that the city is conducting a “thorough analysis” of which factors are affecting congestion. Josh Mohrer, Uber’s general manager for New York City, dismissed concerns that Uber is adding to congestion in the busiest parts of Manhattan. The average number of Uber cars in Manhattan’s central business district between 7 a.m. and 7 p.m. on weekdays is 2,000, Mohrer said in a telephone interview. “The congestion piece, I write off entirely,” he said. These changes are dramatic — Brooklyn now has one Uber pickup for every two taxi pickups — but they obscure where the real battle is taking place. Over 70 percent of Uber pickups and 80 percent of taxi pickups still originate in Manhattan, the city’s busiest, wealthiest borough.6 It appears that Ubers and taxis can coexist outside of Manhattan, at least for now. Within Manhattan, taxis might be in trouble. CLARIFICATION (Oct. 13, 7:15 p.m.): A previous version of this article referred imprecisely to the degree of regulation of the Uber fleet in New York City. Although the number of Uber cars is not regulated, Uber’s drivers and cars are licensed and regulated by the city’s Taxi and Limousine Commission. Dhrumil Mehta and Nate Silver contributed reporting. The Uber data received through our Freedom of Information Law request is available on Github. We limited this analysis to New York City, excluding pickups that happened in TLC taxi zones that are outside of the city’s borders (including Newark airport). Last year’s data included rides from five Uber bases in the city: Unter, Hinter, Weiter, Schmecken and Danach. Cars from those bases handled virtually all Uber rides in the city at that time, according to a TLC spokesman. This year’s data also includes trips from newer Uber bases Grun, Dreist and Drinnen. There is a lag between when a base starts operating and when Uber is required to report its data, so our data set may be missing some Uber rides. In practice, new bases handle very few rides before they are required to report data, an Uber spokesman said, so any gaps are minor and don’t affect our overall findings. South of 110th Street on the West Side, south of 96th Street on the East Side. Taxi zones are geographic areas defined by the city of New York that roughly correspond to neighborhoods. For example, the “Alphabet City” zone is bounded by 14th Street to the north, Houston Street to the south, Avenue B to the west and the East River to the east. For the 2015 data, TLC specified which zone each Uber ride started in. For the 2014 data, it instead had provided latitude/longitude coordinates of pickups. To be able to compare 2014 data with 2015 data, we assigned each 2014 Uber pickup to the appropriate zone and did the same for 2014 and 2015 taxi data, which is published online with latitude/longitude coordinates. Some Midtown taxi zones cover just part of the district, terminating at 58th or 59th Street instead of 60th Street, so the counts of changes in pickups by Uber and taxis are estimates. Here’s one sign that Ubers have taken some taxi drivers off the road: As of Oct. 5, there were 52,612 medallion drivers, who are licensed to drive yellow cabs in the city, according to TLC spokesman Allan Fromberg. That’s down 2.2 percent from the end of 2014. Capital New York pointed out that most Uber rides continued to originate in Manhattan in its analysis last week, using data it got from TLC via its own FOIL request.